Should I use a YouTube Network other than AdSense? 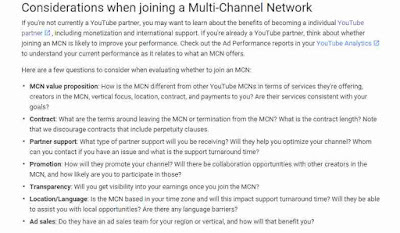 A question grooming in every YouTube beginner as well as experts.So today I will list some myths which you should keep in mind about YouTube Networks also called as MCN (multi-channel networks) before joining them which pretends to give more revenue than AdSense but is that true? Every person wants to have more revenue generated by his YouTube channel even if he has connected with AdSense which gives full revenue to them but with low CPC (cost per click) means even after much clicks you will get only a few bucks. 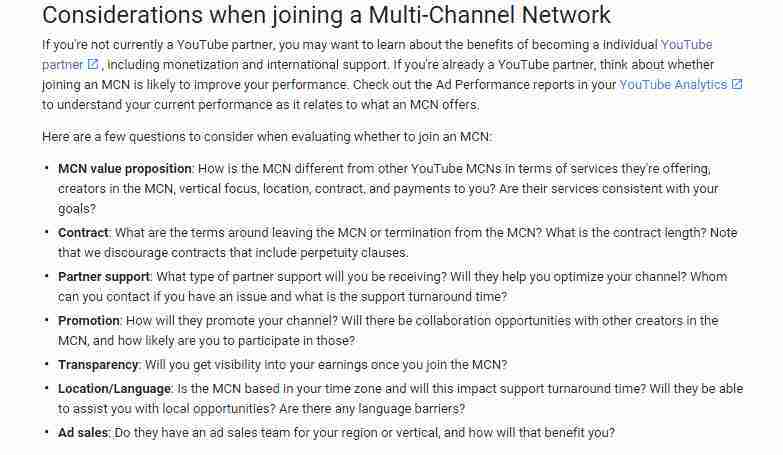 So to get high CPC, people often try to connect their channel to a MCN in hope of high CPC but you should keep in mind the below mentioned things before joining any MCN multi channel network like fullscreen, freedom, bigframe etc. CPC stands for cost per click means the amount you get for each of your ad click.It mainly depends on your keyword and the user location.If ad clicker is from USA or Europe, certainly you will get high cpc rate on each click but if you get clicks from some third world countries like India, you will not get much cpc rate that could even make a dollar on 50 clicks.But CPC rate can be increased using our tips here. What MCN Actually is ? MCN stands for Multi Channel Network is a kind of YouTube advertising network which has its own advertisers and are not dependent on AdSense from any side. They have their own advertisers and their own CPC rates which are obviously higher than AdSense.Because AdSense manages millions of channels and they cannot manage every single video to place relevant ads.So MCN is a good choice if you have many channels. Ofcorse yes! YouTube networks can be 80% more beneficial if you have many channels but 1 AdSense account.Because one AdSense account will place 1 type of ads on all of your channels. Important thing for you is that never attach all of your channels with same AdSense. Always use google accounts with different AdSense accounts on different channels. You will earn more in this way.Because every AdSense account will display different niche based ads. But in some cases, you will not get that much revenue as you expect from your channel.Sometimes these networks place high quality premium ads on your channel if you are the correct requirement for them but in most cases, as i have seen, they will place normal ads which will produce normal income for your channel. So if you have decided to join a YouTube network, you should carefully read below mentioned topics because once you allow them to link your account with them, it will be a hard process to get it back immediately. Before joining a YouTube network, you should first check whether this network offers contract or not.Some networks will try to bind you with them by offering you a 3 months or 2 years contract period in which you will not be able to leave that YouTube network even if you want to be.So always be conscious about a contract policy. This is also called as lock-in policy which locks you in their network and you will not be able to do anything before that contract period expiration date. Example: For example, Fullscreen network offers you a 2 year based contract. 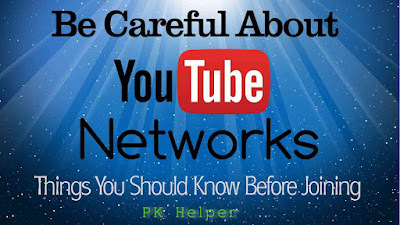 That means you will not be able to leave that network before 2 years.So if you Have decided to join a network, you should keep in mind about their contract.For precaution, you can contact them and ask about contract and whatever you want to ask.For more info, read this post on Full features of YouTube Networks. Revenue share is the share of revenue or of your earnings which you will share with that network.Every YouTube Network will sign a contract with you in which they will ask about the revenue share from you. In other words, they are signing from you on a piece of paper which describes clearly that I will share my earnings with this network. Obviously they will get a share from your earnings because they will try to increase your earnings and in return, they will get a percentage of your earnings so before signing contract, you should be aware of what revenue split that network takes. Example : For example, Fullscreen offers a revenue split of 80/20 mean they will get 20% of earnings made by your YouTube channel.So keep in mind that if they helps you in making more money then they will take a share too.For more info, read this post on Full features of YouTube Networks. You should make it clear that the YouTube network with which you are going to partner, has what type of payment options.It is very important because all YouTube networks use paypal for payments but paypal is not available in certain countries including South Asian countries. Some YouTube networks like Pave network offer other payment options like cheque and Western Union because these are easily available in many countries. So before applying to a YouTube network, you should make clear everything about payment options. Example: For example, Fullscreen network offers payment worldwide only through PayPal and Cheque only in USA.For further details, you should visit their website.For more info, read this post on Full features of YouTube Networks. You should first confirm that which network has set what minimum threshold amount for which payment service.Payment threshold is the minimum amount of dollars after which you can request a payment. You cannot request your payment even if you earnings is 1$ less than the minimum threshold.So you should make it clear before joining a YouTube network that what minimum threshold has this YouTube network and for what payment option or service.Most of the networks offer low minimum payment threshold for Paypal only. Example: For example, fullscreen, a YouTube Network, offers 10$ minimum payment threshold for PayPal but 100$ for Bank Account or Cheque only in US.For real time info, you should visit their site.For more info, read this post on All Minimum Threshold of YouTube Networks. You should keep in mind that what is payment duration of a YouTube network which you want to join.Either they pay you after first month or after second month of YouTube confirmation.Because every network makes it clear that whether you have generated money by right means or by wrong means. After inspection, they deduct amount of invalid clicks and return it back to advertisers.AdSense pays you most quickly because AdSense and YouTube are in close relation to each other and they both collectively inspect and their inspection method is also very fast. Example: For example, freedom will pay you 2 months after your real time earnings. So if you have earned money in January, then YouTube will send money to that network in February and after their satisfaction in end of February, they will pay you in March. So what I said is truth. If you read their official statement, they have mentioned like this but not exactly like this. It is very important to know about how much old is that YouTube network is. Because old networks are more trusted due to which we can easily trust them as well. Obviously top YouTube networks are trusted more than others due to their old age and popularity among you tubers.Always choose a trusted network which is also old. Example: For example, Fullscreen is a trusted network and there are thousands of YouTubers attached with them.But you should choose yourself which is best for you.For more info, read this post on All things about YouTube Networks. Before joining a YouTube network, you should first carefully read about them and visit different forums about pones and cons of these networks separately. Because, even after their high features, no one can assume how they will be after joining so it is very important to read reviews about them whether this network is trusted and good or not.Whether they pay at time or not.Whether they gives what they say or not.Because I have seen many networks about which people report different issues and complains that they do not pay you or they are not trusted or they make payments late.So be careful in this matter. Example: For example, Fullscreen is a network about which I have heard mostly good and sometimes bad too due to their payment threshold and un availability of payment options outside the USA.For more info, read this post on All Reviews about YouTube Networks. 8-Does that Network Have Analytics or Real Time Earning Report? Before joining a YouTube Network, one of the most important things you should make clear is that a YouTube network shows real time earning report or not. Does that network has a real time analytics tab like AdSense. AdSense shows a real time analytics tab which shows you your real time earnings and updates every second so whenever you want to track your earnings, you would be able to track it via analytics tab. But unfortunately, I have not seen any analytics tab like AdSense on any other network which means they forbids us to track our earnings report. So before joining a network, you should have researched about different networks and their dashboard options and appearance and how much clear they are. Example: For example, Freedom network is not that much clear as it should be. They just show you simple dashboard and no real time earnings report and also they have outdated tabs like Revenue Split share.This thing should be cleared before any kind of contract or attachment with any network. 9-Any Thing You Want to Ask? Yes we are here to help you if you are planning to do something like above. So if you have some questions in your mind or you want to make something clear, you can ask us and we will surely help you out with our experienced members. I myself have much knowledge about these networks so you can ask me too. Don't forget to plus 1 us and share this useful piece of knowledge with every YouTuber you know to help them in this regard. We will keep this thread updated with new updates again and again over the time to keep you people updated. Hello Can you Please tell me .. Mere 10k Views youtube par hogye hain Par youtube nay show krny k baad phir kaam hogye hain Par Video par uthny he views hain Any solution?? ?